Here we are – officially in the fall season with the holidays just around the corner. The Christmas themed October Stamp of the Month (SOTM), Home for the Holidays, is available for a limited time. It can be yours for just $5.00 with a $50 purchase but it is only available to you during October. You can also purchase the October Stamp of the Month for $17.95 without a qualifying purchase. I especially love the polar bear image. The set coordinates with the Art Philosophy cartridge and provides measurements to cut pieces for all but two of the images (the candy cane and candy don’t have images on Art Philosophy but all of the others do) . 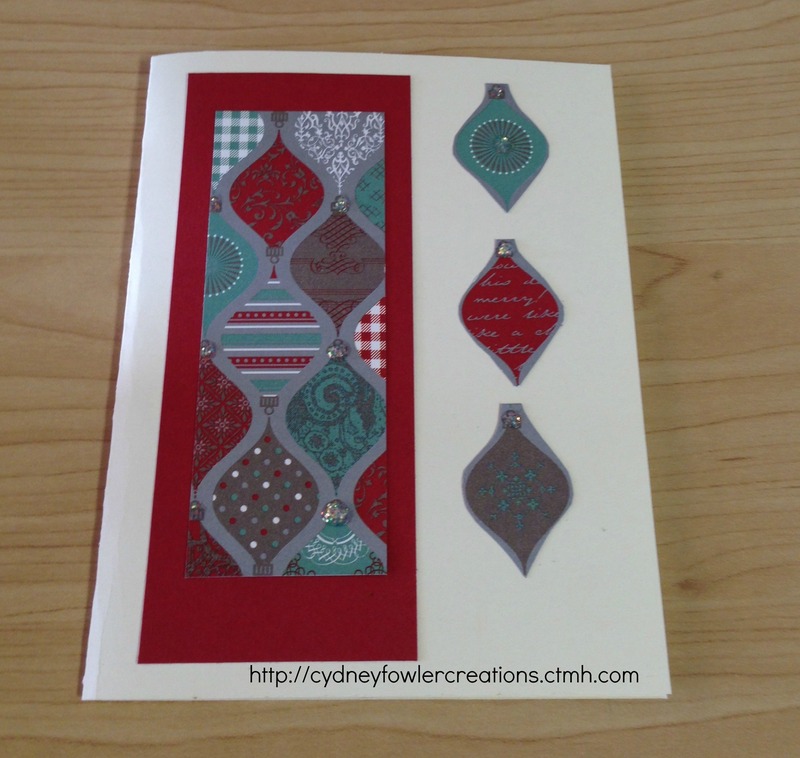 Here is a sample set I cut out using the CTMH Art Philosophy Cricut cartridge and stamped. 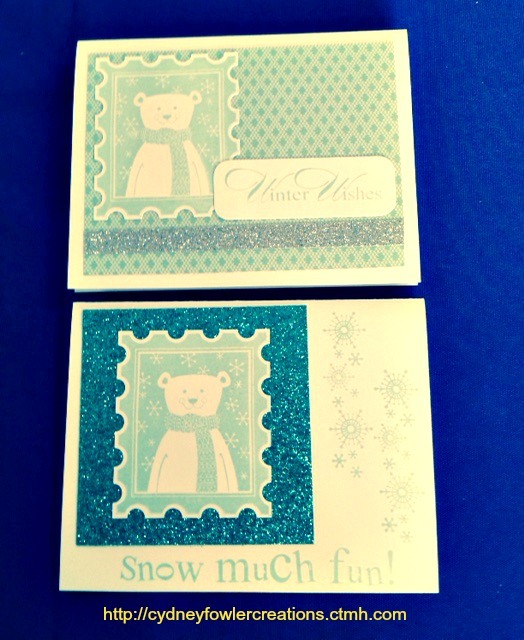 I also made two cards with the polar bear postage stamp. One with glitter paper and the other with paper from the Snowhaven paper pack. So cute! You can purchase the Stamp of the Month and the supplies online at my Close to my Heart business address at http://cydneyfowlercreations.ctmh.com. Ink Pads: Glacier #Z2641, Topiary #Z2155, Ponderosa Pine #Z2145, Ruby # Z2170. The bright red on the December 25 tag is Holiday Red and that is a discontinued color, but you can use Cranberry in its place, #Z2116. If you are using the Cricut Explore die cut machine instead of a legacy model, you can insert codes in search to find the cuts on Art Philosophy. Be sure to be at search all images and enter the code with the # in front of it. 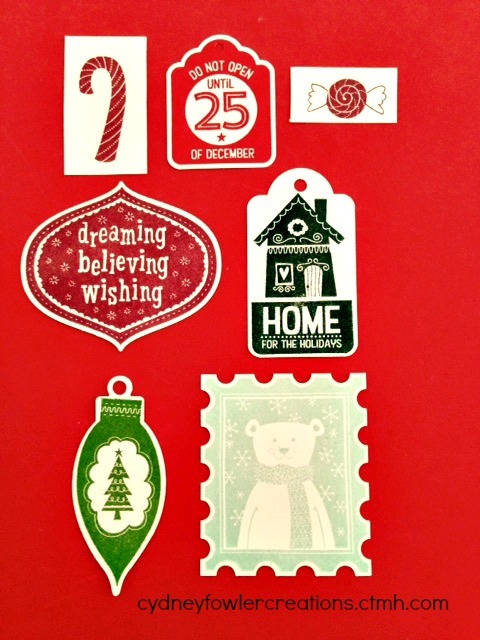 Light bulb shape ornament tag is #M41BE5; Polar bear stamp is #M450F2, the Home for the Holidays tag is #M45A94, The Do Not Open tag is #M45080 and the larger ornament is #M4003B. 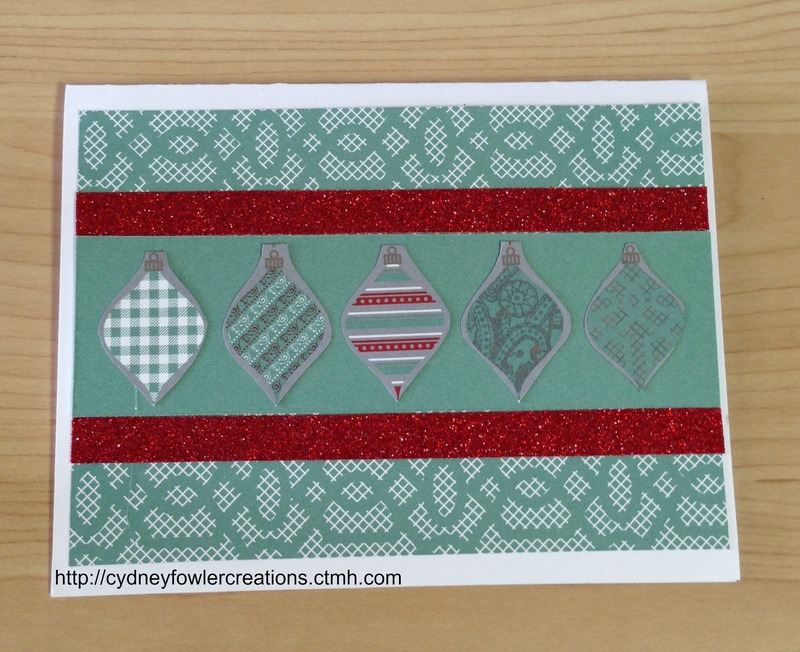 I hope you enjoy this peek at the possibilities using the October Stamp of the Month! Leave a comment below or if you have questions, please feel free to email me at cydneyfowlercreations@gmail.com and I will respond as soon as possible. Click here to be directed to my online CTMH shop. 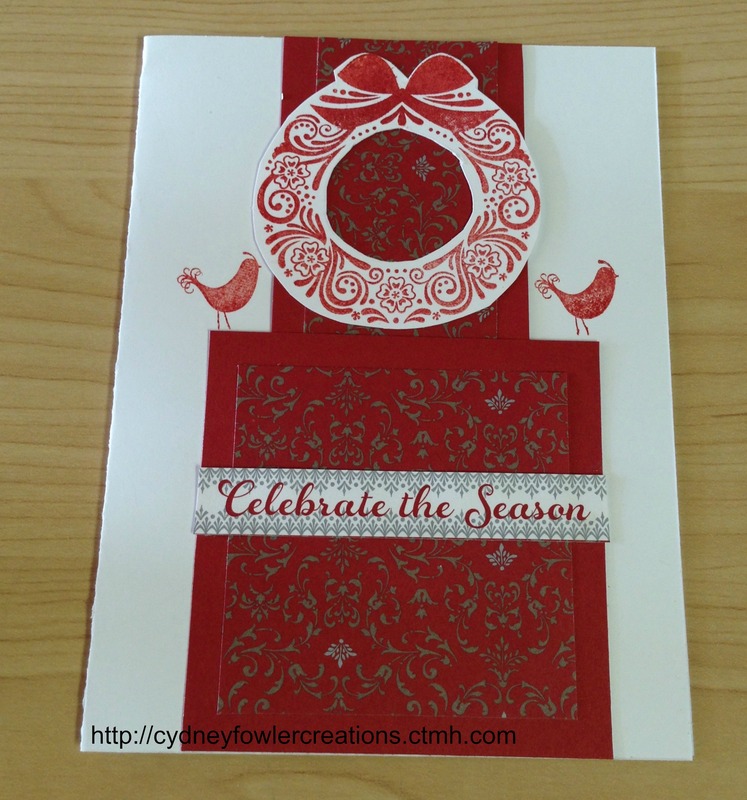 Welcome to the Damask Divas December blog hop featuring the Close to my Heart paper pack “Frosted” – perfect for holiday cards. If you came here from Brenda’s blog you are in the right place. If you want to start at the beginning or see the entire list of participants visit the Damask Divas blog by clicking here. I made several cards. The first two were made with scraps from the third card pictured here. I used the Colonial White card pack for the base and envelopes. 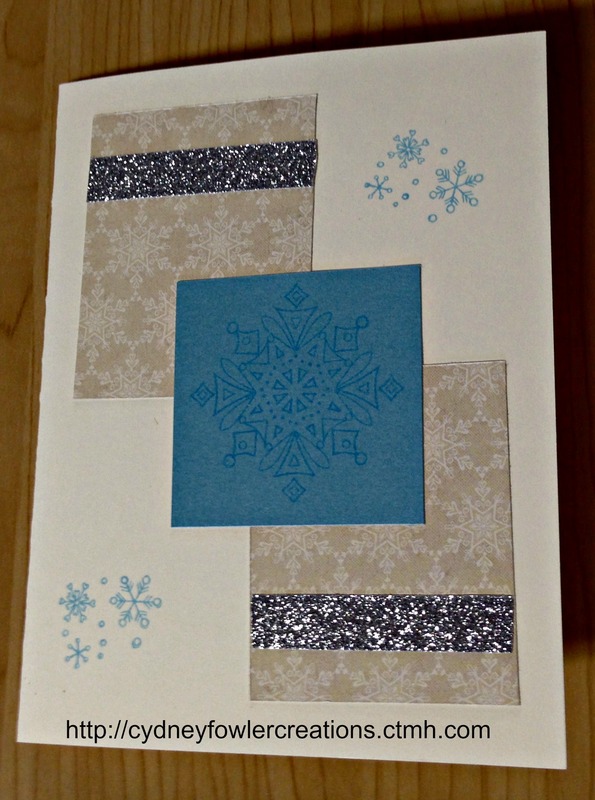 The patterned paper is Frosted, the solid colors are Champagne and Crystal Blue. I thought these colors complimented each other nicely. I love the way CTMH papers coordinate so well! 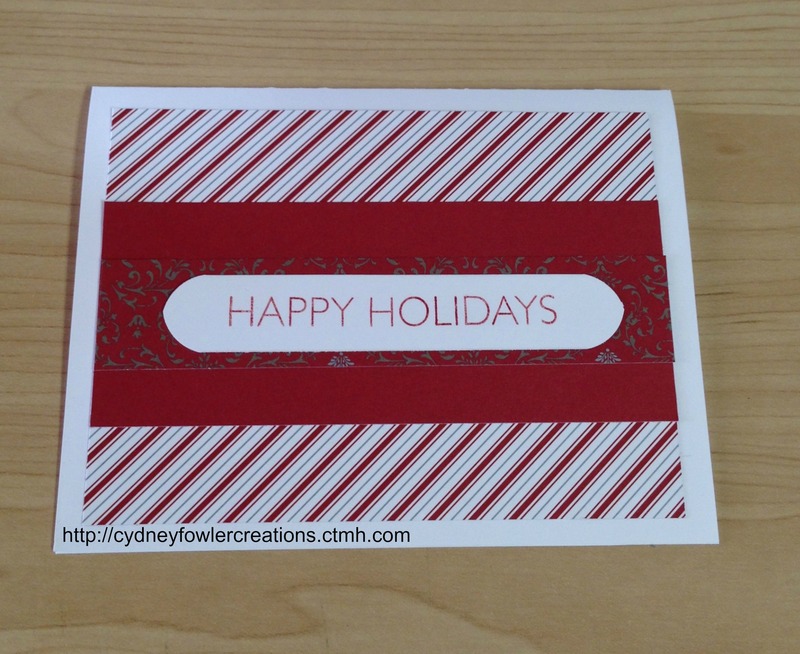 Same design – two rectangles and a square with snowflake stamping. I added a little silver shimmer trim to give it some bling with the neutral colors. 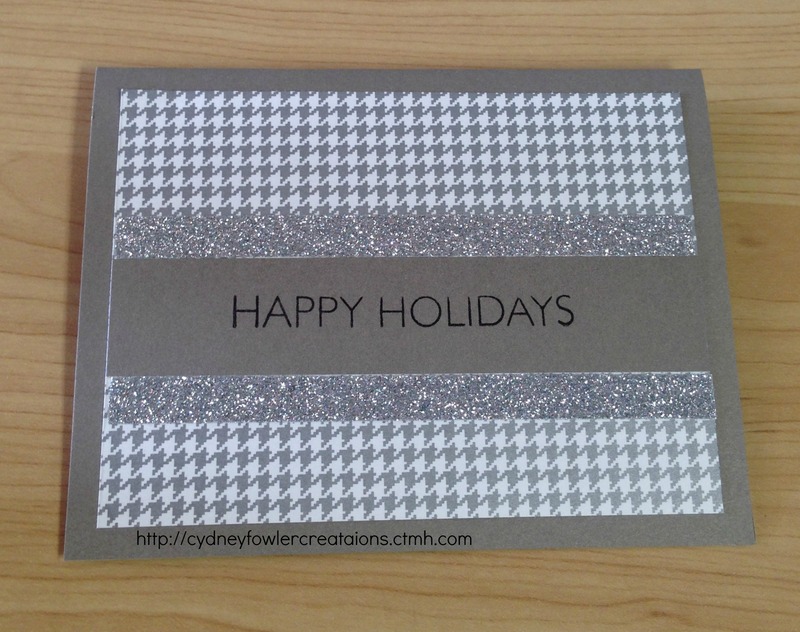 The main card design has more details with the addition of a sparkly snowflake, ribbon and a banner. 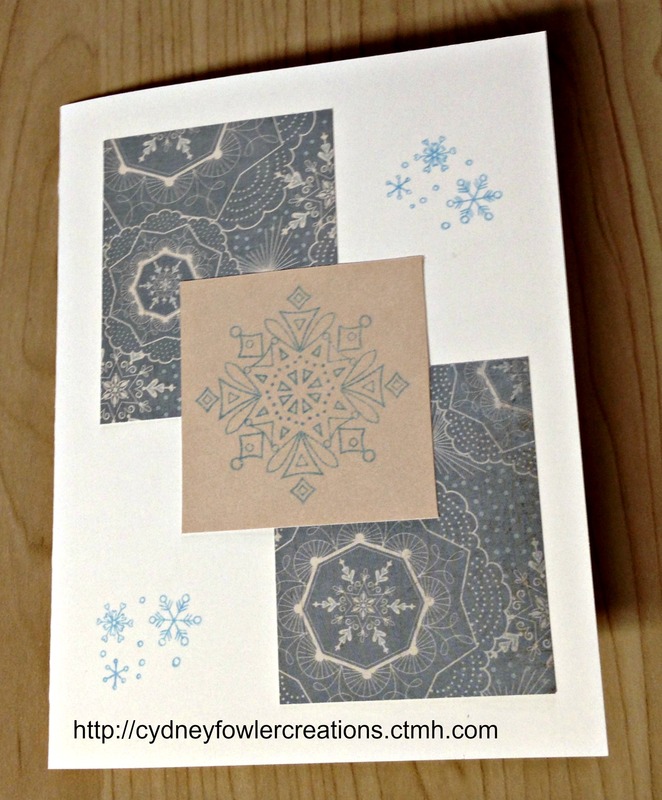 I continued the snowflake theme with the stamping. I thought the Peace sentiment went with the peaceful theme of the card. 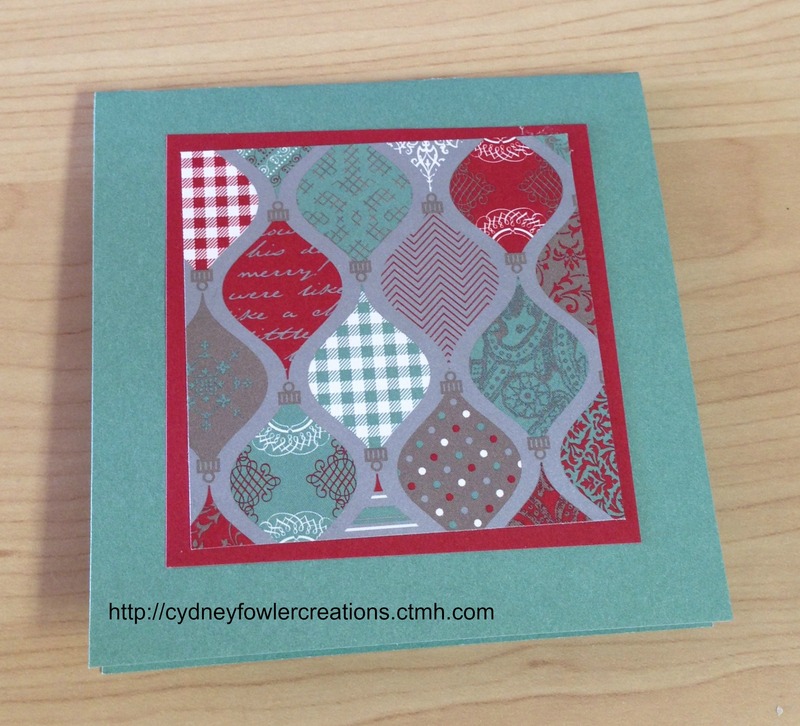 The snowflake was cut at 2″ using the Art Philosophy CTMH Cricut cartridge (item #Z1686). The banner was cut at 2-1/2″ using the same cartridge. To purchase CTMH supplies visit my online shop at http://cydneyfowlercreations.ctmh.com or your consultant’s site if you have one already. I used Crystal glitter glue and ribbon I had on hand. I hope you are inspired by my cards! Your next stop is Lilian’s blog – click here. Thanks for stopping by. Happy Crafting and Happy Holidays to you! 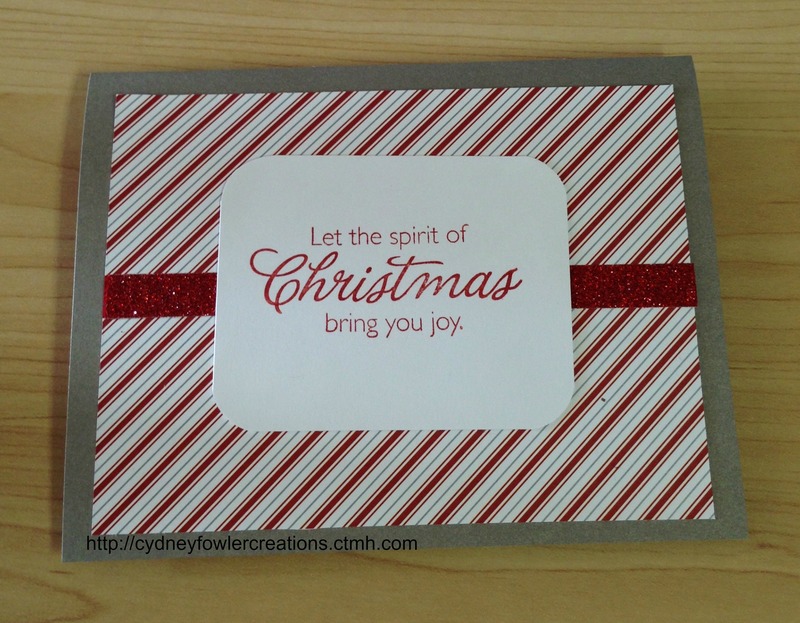 Welcome to the Damask Divas Blog Hop featuring the Sparkle and Shine paper pack from the just released “Holidays from the Heart Gift Guide” – items from this special supplement to the current Idea Book can be ordered October 15 through December 31. Some items will only be available while supplies last, so get your holiday crafting goodies early. You can get starred items for free with every $100 order (can be combined with orders from the current Idea Book). Shop with me online at http://cydneyfowlercreations.ctmh.com or with your own consultant. If you got here from PaperCrafting101 you are in the right place. If you want to start at the beginning click here to go to the Damask Diva’s Blog. 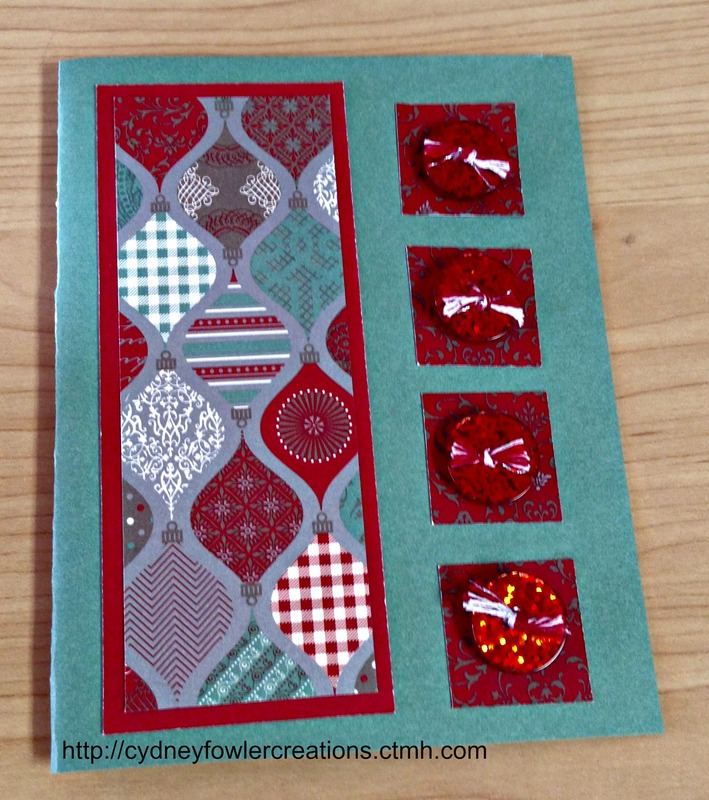 I made a group of greeting cards with the Sparkle and Shine paper pack and some CTMH embellishments. I just cut various size paper pieces and arranged them on A2 card bases (5 1/2″ by 4 1/2″), except one I made into a 4″ by 4″ card. I then added various kinds of bling and sayings to each card. Here is a photo of the group of cards. 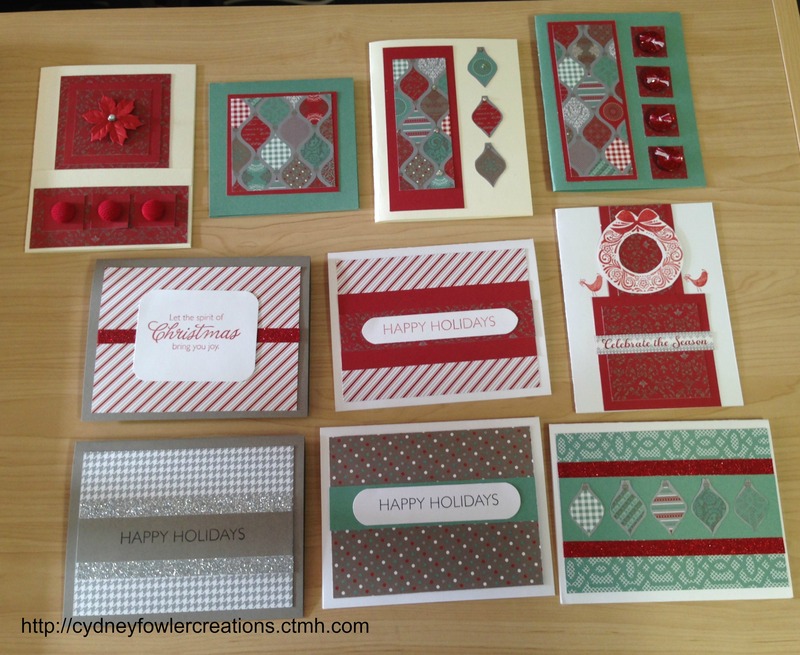 The second card from the top left is a 4″ by 4″ card. Mini Medley Accents Ruby Collection $5.95 Item # Z1861 (sparkle buttons, corduroy buttons, metallic twine). The poinsettia brad was from a retired packet of embellishments. 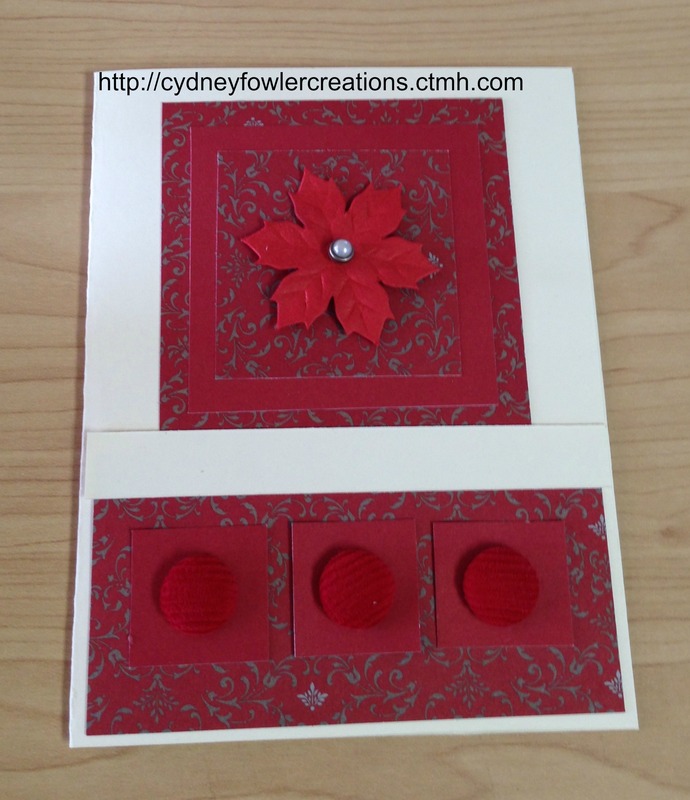 The mini medley ruby assortment (above) does come with two cute corduroy flowers you could use in place of it. I hope these cards inspire you to make your own! Next on our hop is Jamie at CreativeRN. Happy Crafting! Welcome to the Damask Divas February Blog Hop featuring the For Always paper pack by Close to my Heart. Thanks so much for visiting! If you got here from Roberta’s site, then you are in the right place. If you lose your spot or want to start at the beginning go back to the Damask Divas home page. 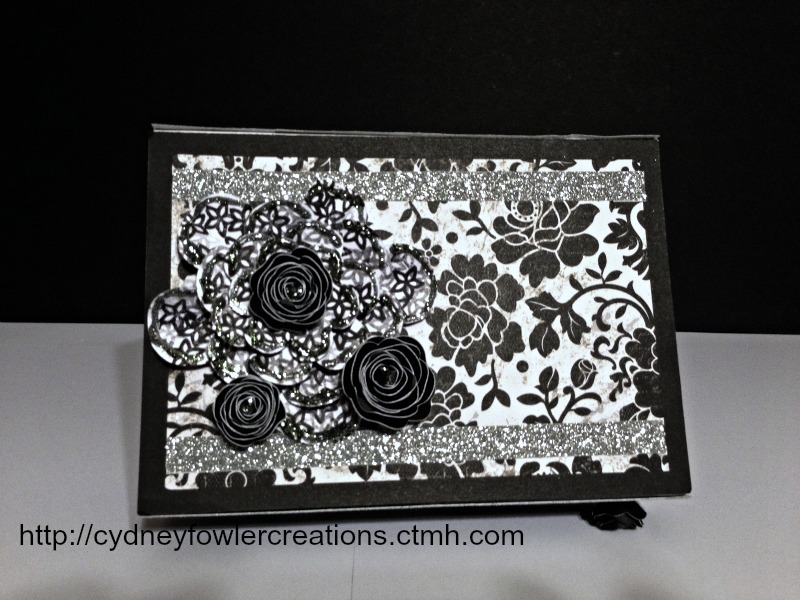 I love the black and white patterned papers in this new pack for Spring/Summer 2013. It is very elegant and will lend itself to many different projects. 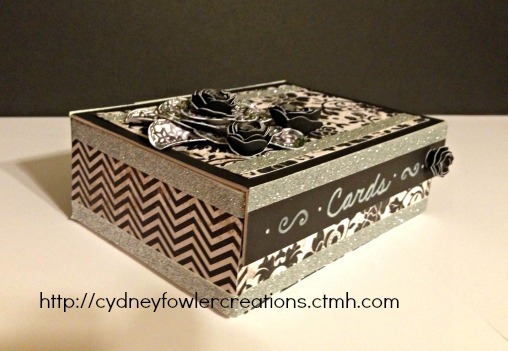 I covered the chipboard card box from CTMH with the For Always papers and silver shimmer trim. The paper flowers were made using the Artiste Cricut Cartridge exclusive to CTMH. The larger flower was cut flat in 3 sizes then I stamped a pattern with black ink then layered with pop dots and put a small black flower in the center. 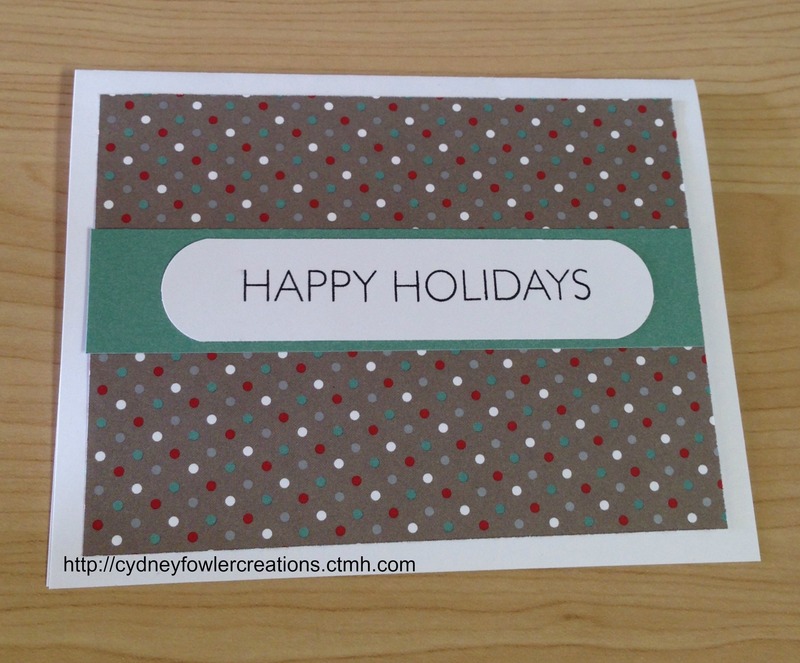 I used the CTMH Chalkboard pen to write Cards on the front (remember – the chalk pen is a marker and is not erasable like chalk; it just looks like chalk in a very nice way). I thought the silver shimmer tape added a nice sparkle. I also added some glitter glue to the edge of the big flower. 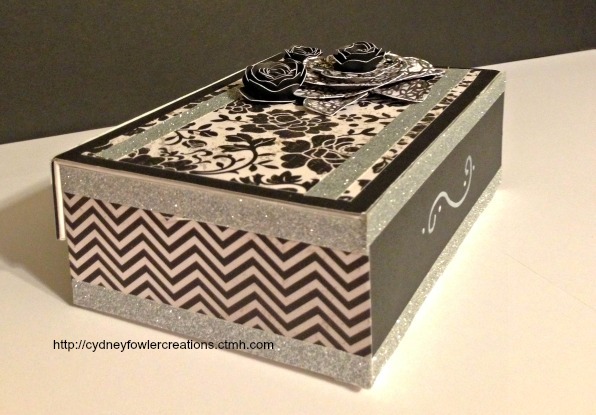 I put the Chevron paper on the sides of the box and a little swirl on the back with the chalk pen. I hope you are inspired by this creation! Next visit fellow Damask Divas team member, Sandra. Don’t forget to enter the sponsored giveaway on the Damask Divas home page here . Happy Crafting!